The Mighty Thor is dead. 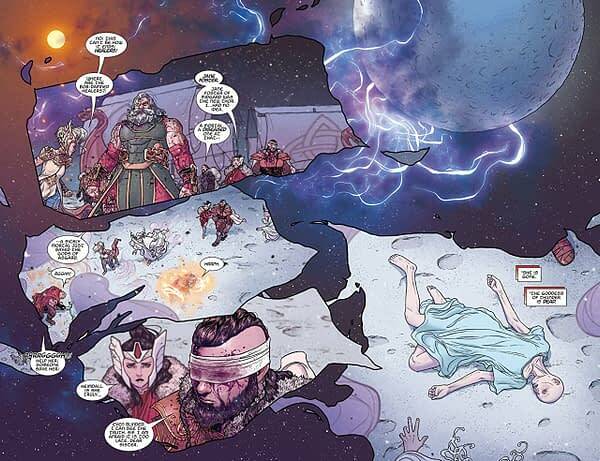 Asgardia is in shambles, and the Odinson is distraught. Jane Foster is standing at the gates of Valhalla and is met by Odin himself. Jane feels that her story is not over, and it may not be. The Odinson attempts to channel the power of the god Tempest, which once dwelled in Mjolnir, to bring Jane back to the land of the living. Go ahead and expect spoilers in this review, because I can’t really talk about what I genuinely liked about this issue without giving away the big twist of the comic. So, spoiler warning to reiterate the point. I really liked that Jane Foster didn’t stay dead. I know that the Big Two have practically killed the concept of death itself to the point where Hunt for Wolverine was a forgone conclusion since the announcement of Death of Wolverine years ago, but Jane Foster shouldn’t have stayed dead. It isn’t the ending this character deserves, and it’s not as satisfying. I’ll admit that this opinion is even more subjective than usual (not that a truly objective critic exists, but that is a conversation for another day), but killing Jane would have been the expected thing to do. Jane’s cancer seemed like something of a built-in trapdoor for this character. When “The Death of the Mighty Thor” was announced, I just assumed that it was said trapdoor being operated. It’s not great watching heroes die, especially to something as real and familiar as cancer (even if Death of Captain Marvel is a freaking masterpiece). Seeing Jane make it is almost comforting as a result, but the cancer isn’t magic-ed away, which shows some restraint. Beyond that, Odin’s acceptance of Jane is gratifying. The Odinson’s complete breakdown upon Jane’s death adds some emotional heft. As always, Russel Dauterman’s artwork is downright gorgeous, and the depiction of Valhalla and the afterlife is beautiful. 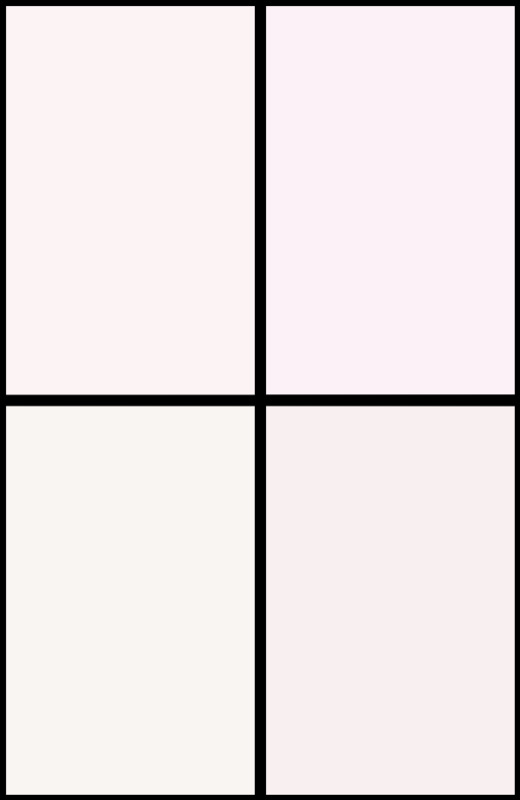 The creativity of the paneling looks good. 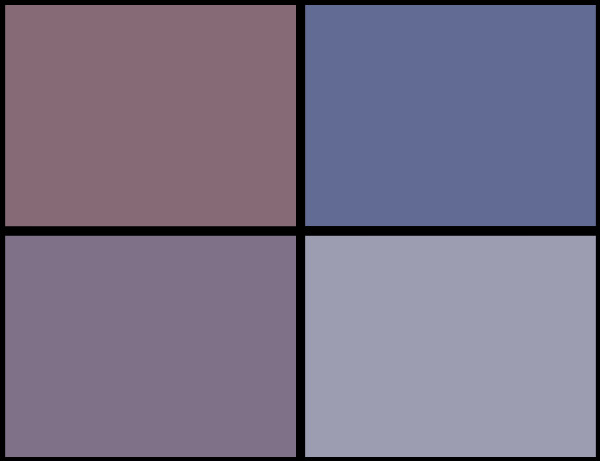 Matthew Wilson’s color work is bright, wild, and stunning. 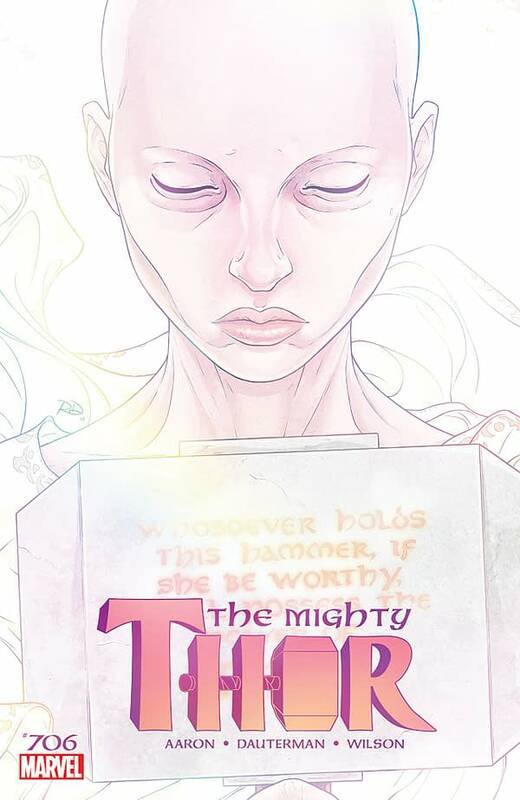 The Mighty Thor #706 is a bittersweet yet ultimately heartwarming conclusion to this arc and Jane Foster’s tenure as Thor. Jason Aaron has given this saga a near-perfect finish, and I look forward to the epilogue issue to come. This one is highly recommended. Give it a read.